Superior Scaffold rocks people’s troubles away every day and even some nights. Yes, it’s our job to ease the minds of our clients and their audience so they can do what they do best. We not only protect the customers from the myriad of construction projects that can go on but we also allow businesses to remain open while said project rocks on. 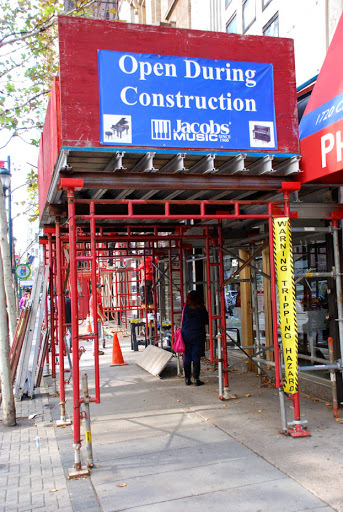 Consider us the “The Rock ‘n’ Roll Scaffolders” of the tri-state area. And how do we do it? 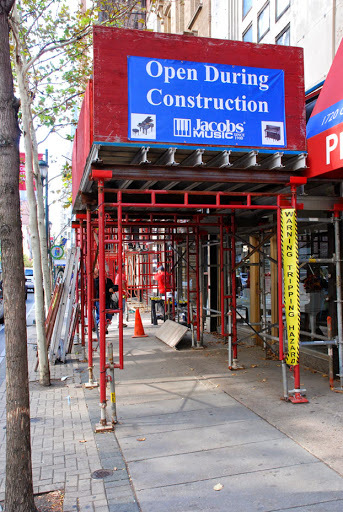 By composing the best scaffolding for the job. Just like this overhead protection (canopy) at Jacobs Music in Center City, Philadelphia, PA. It’s not big, it’s not fancy but it looks great and, most importantly, it does the job. 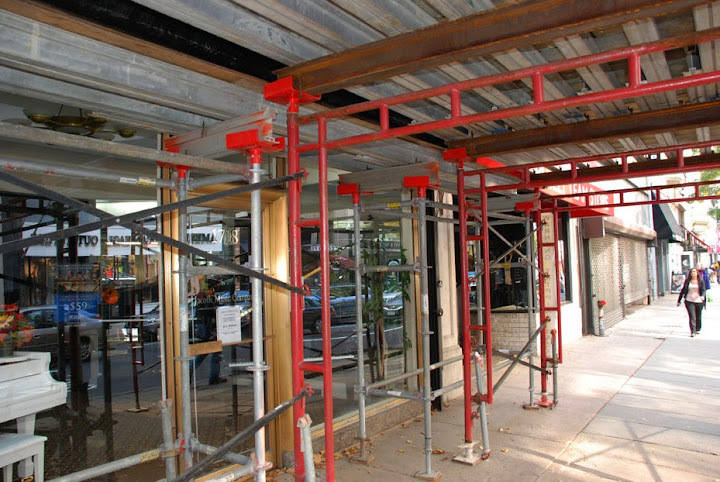 Not only did we provide a sidewalk shed (using scaffold frames, steel beams, aluminum beams and debris panels) but if you look carefully there is a small section of shoring as well. 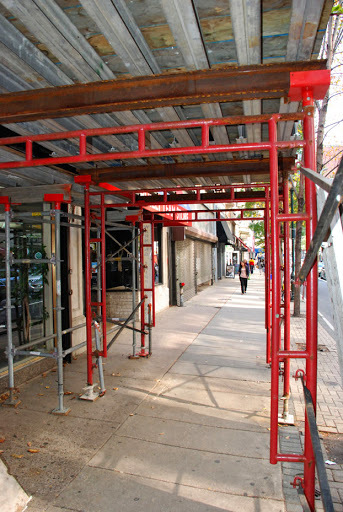 It was all part of their facelift to give the storefront more exposure with new windows and entryway. 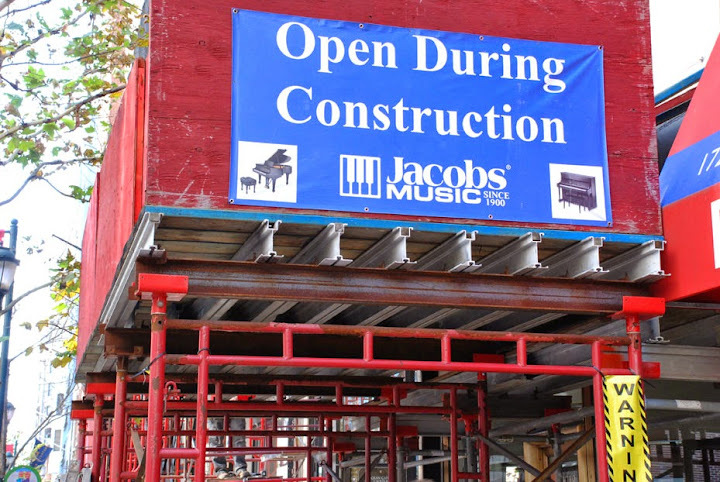 We also put a Jacobs Music banner on the ends of the canopy – insuring customers knew exactly which proprietor was behind the stage (so to speak). This allowed Jacobs Music to rock on! You can see the finished results here. On this job, you could say that we lived for the music. In their day, these guys were the true rock stars! To learn more about Jacobs Music – click here. This entry was posted on Tuesday, May 12th, 2015 at 7:27 am	and is filed under Canopy, Frame. You can follow any responses to this entry through the RSS 2.0 feed. Both comments and pings are currently closed.